No! This is not a story about UFOs. 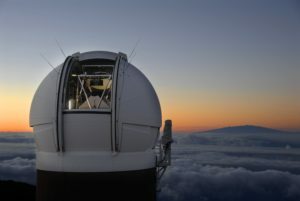 On 19 October 2017, astronomers using the Panoramic Survey Telescope and Rapid Response System 1 (Pan-STARRS1)in Hawaii made the first detection of an interstellar object passing through our solar system. PanSTARRS 1 uses a Moving Object Processing System (MOPS) that is designed to detect fast moving objects in the vicinity of the Earth as well as those moving as slowly as the fastest proper motion stars. The original goal of the PanSTARRS project, which began observations in 2007, was to detect objects 100 times fainter than previous sky surveys, including 99% of the asteroids 300 meters (1,309 feet) or larger that come near Earth’s orbit. The PanSTARRS1 MOPS is described in more detail here. The interstellar object discovered by Pan-STARRS1 was designated Asteroid 1I/2017 U1, and later was named Oumuamua, which means “a messenger from afar arriving first” in Hawaiian. 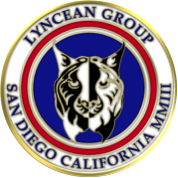 The red-hued object has a highly-elongated shape (cigar-shaped) with a length of about a quarter mile (1,320 feet, 402 meters) and a diameter of about 120 feet (40 meters). Oumuamua was unlike any asteroid or comet previously observed in our solar system. 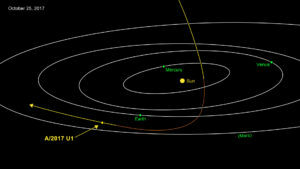 Before its detection by PanSTARRS1, Oumuamua had entered our solar system and made its closest approach to the Sun on 19 September 2017, reaching a speed of about 196,000 mph (315,400 km/h). From analysis of its trajectory, astronomers determined that Oumuamua most likely came from outside our solar system. On its outbound trajectory, it was moving fast enough to escape the Sun’s gravitational field and break free of the solar system, never to return. 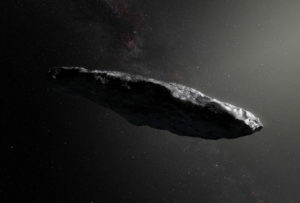 Oumuamua is dense, possibly rocky or with high metal content, lacks significant amounts of water or ice, and that its surface is now dark and reddened due to the effects of irradiation from cosmic rays over millions of years….it is completely inert, without the faintest hint of dust around it. Preliminary orbital calculations suggested that the object had come from the approximate direction of the bright star Vega, in the northern constellation of Lyra. However, even travelling at a breakneck speed of about 95,000 kilometers/hour (59,000 mph), it took so long for the interstellar object to make the journey to our Solar System that Vega was not near that position when the asteroid was there about 300,000 years ago. Oumuamua may well have been wandering through the Milky Way, unattached to any star system, for hundreds of millions of years before its chance encounter with the Solar System. The Breakthrough Listen initiative reported that the Green Bank Telescope in West Virginia detected no evidence of artificial signals emanating from the object. 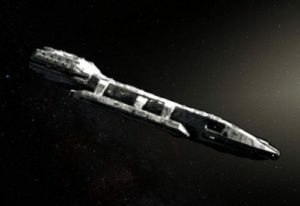 To the disappointment of science fiction fans, all observations were consistent with Oumuamua being a natural object, and not a derelict spaceship, like the Battlestar Galactica. David Clery’s 21 May 2018 article, “This asteroid came from another solar system—and it’s here to stay,” describes the 2014 discovery and recent analysis of an object in our solar that is in a retrograde, heliocentric orbit at approximately the distance of Jupiter from the Sun (483.8 million miles / 778.6 million km). 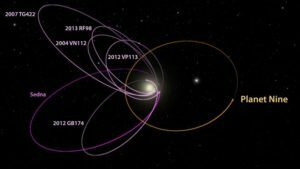 The asteroid, identified as 2015 BZ509, is traveling around our solar system in the opposite directions of almost everything else in an orbit with unusual elongation and inclination to the plane of the solar system. 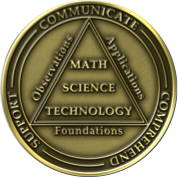 The recent analysis indicates that this is a stable orbit, and not a fly-by trajectory through our solar system like the brief visit of Oumuamua. You can view a short animation created by the Large Binocular Telescope Observatory to illustrate the dynamics of the unusual retrograde orbit of 2015 BZ509 here.